Foxmarks, one of the most popular Firefox add-ons for social bookmarks, is re-branding itself as Xmarks and making significant additions to its functionality. Since Foxmarks has collected so many urls (600 million to be exact), the company is creating a search feature that turns up pre-qualified results. Since Foxmarks’ launch, the bookmark synchronization add-on has been downloaded over 14 million times, with most downloads originating from Firefox users, though the add-on launched Internet Explorer and Safari browser capabilities in early February. 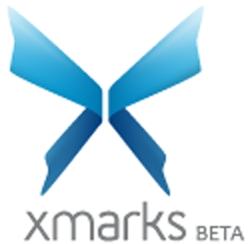 The Xmarks feature produces search results based on what millions of users in its community are bookmarking. Users can view each result’s number of bookmarks, popularity ratings and reviews, and a user-generated description of the site. 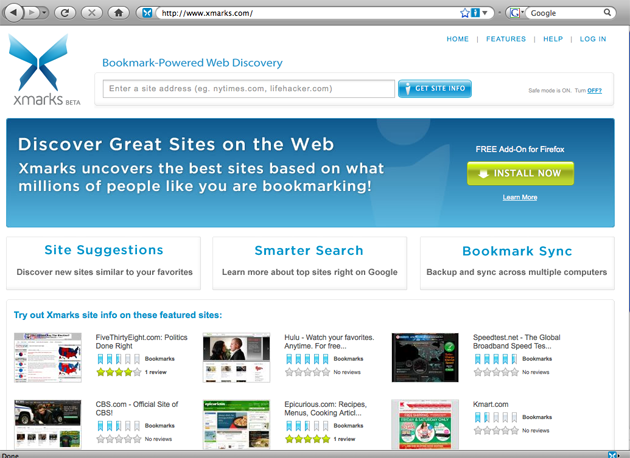 The search engine also recommends similar sites to the user. If the user downloads the Xmarks add-on, the technology will mark popular bookmarked sites (with an icon) in any Google, Yahoo or MSN Live searches. 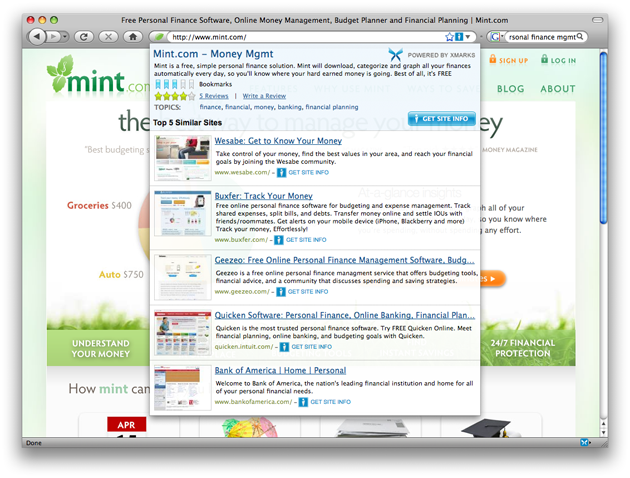 Users can hover over each icon to see a thumbnail view of the Xmarks reviews and information on the site. Users can also click an Xmarks icon in their address bar to learn more about any site they are currently visiting. Much of the information on Xmarks, such as site summaries and reviews is user-generated and the hope is that users will create a wiki for website reviews, according to CEO James Joaquin. Currently, the Xmarks add-on is only available for Firefox users but is expected to reach Internet Explorer and Safari users in the near future. They are also in talks to extend Xmarks capabilities to Google’s Chrome browser. Founded by Mitch Kapor and Todd Agulnick, Xmarks competes with other popular social bookmarking applications like Delicious and StumbleUpon. While Delicious’s search feature is similar, Xmarks’ search result snapshot is more comprehensive and informative with summaries, reviews and similar sites included in the result. 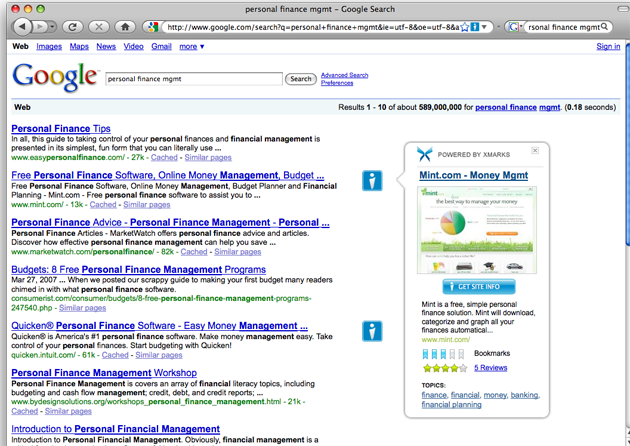 And the ability to see this comprehensive Xmarks snapshot in a Google search or in the address bar is unique. Xmarks’ technology is undoubtedly innovative and useful, particularly to users looking to deepen the information-return of their searches. It is interesting, however, that the company has chosen to re-brand their product line after spending over two years building what could be called a Firefox-related brand around Foxmarks . Joaquin says that Firefox has created a rich environment for the company to distribute its add-on, but the company is now hoping to gain additional momentum from other browsers. Part of that effort includes a less Firefox-centric brand. And as Internet Explorer continues to lose market share and the battle of the browsers becomes more heated, it will be important for Xmarks to diversify its user base.